University of Toronto Press, 9781487503741, 240pp. Queering Urban Justice foregrounds visions of urban justice that are critical of racial and colonial capitalism, and asks: What would it mean to map space in ways that address very real histories of displacement and erasure? What would it mean to regard Queer, Trans, Black, Indigenous, and People of Colour (QTBIPOC) as geographic subjects who model different ways of inhabiting and sharing space? The volume describes city spaces as sites where bodies are exhaustively documented while others barely register as subjects. The editors and contributors interrogate the forces that have allowed QTBIPOC to be imagined as absent from the very spaces they have long invested in. 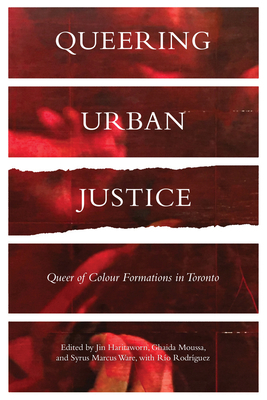 From the violent displacement of poor, disabled, racialized, and sexualized bodies from Toronto's gay village, to the erasure of queer racialized bodies in the academy, Queering Urban Justice offers new directions to all who are interested in acting on the intersections of social, racial, economic, urban, migrant, and disability justice.